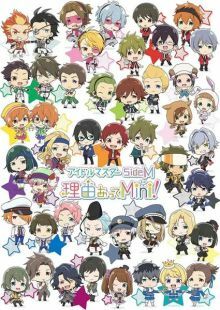 Titre original : The Idom@ster SideM Wake Atte Mini! The Idomaster SideM Wake Atte Mini! The Idom@ster Side M Wake Atte Mini! The Idomaster Side M Wake Atte Mini! Titre français : The Idom@ster Side M Wake Atte Mini! Spin-off de la série The Idolm@aster SideM.